(Manual Seat) To move a seat forward or backward, raise the lever and slide the seat to the desired position and release the lever. Make sure the lever returns to its original position and the seat is locked in place by attempting to push it forward and backward. (Power Seat) To slide the seat, move the slide lifter switch on the outside of the seat to the front or back and hold it. Release the switch at the desired position. (Manual Seat) To adjust the seat height, move the lever up or down. 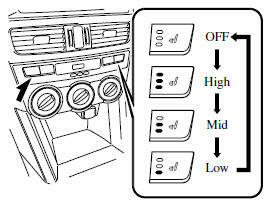 (Power Seat) To adjust the seat height, move the switch up or down. (Power Seat) To adjust the front height of the seat bottom, raise or lower the front of the slide lifter switch. (Manual Seat) To change the seatback angle, lean forward slightly while raising the lever. Then lean back to the desired position and release the lever. Make sure the lever returns to its original position and the seatback is locked in place by attempting to push it forward and backward. (Power Seat) To change the seatback angle, press the front or rear side of the reclining switch. Release the switch at the desired position. 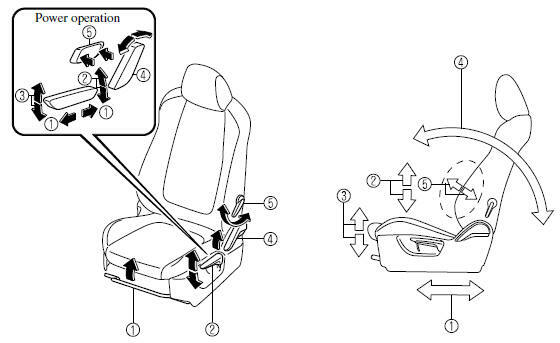 (Manual Operation) To increase the seat firmness, push the lever backward. Pull the lever forward to decrease firmness. (Power Operation) To increase the seat firmness, press and hold the front part of the switch to the desired position, then release it. Press the rear part of the switch to decrease firmness. The front seats are electrically heated. The ignition must be switched ON. Press the seat warmer switch to illuminate the indicator light while the ignition is switched ON. 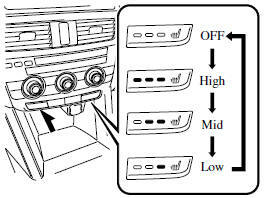 The mode changes as follow each time the seat warmer switch is pressed. Be careful when using the seat warmer: The heat from the seat warmer may be too hot for some people, as indicated below, and could cause a low-temperature burn. ● Infants, small babies, elderly people, and physically challenged people Ø People with delicate skin Ø People who are excessively fatigued Ø People who are intoxicated Ø People who have taken sleepinducing medicine such as sleeping pills or cold medicine Do not use the seat warmer with anything having high moistureretention ability such as a blanket or cushion on the seat: The seat may be heated excessively and cause a low-temperature burn. Do not use the seat warmer even when taking a short nap in the vehicle: The seat may be heated excessively and cause a low-temperature burn. Do not place heavy objects with sharp projections on the seat, or insert needles or pins into it: This could cause the seat to become excessively heated and result in injury from a minor burn. Do not use organic solvents to clean the seat. It may damage the seat surface and the heater. • If the ignition is switched off while the seat warmer is operating (High, Mid or Low) and then switched ON again, the seat warmer will automatically operate at the temperature set before switching off the ignition. • Use the seat warmer when the engine is running. Leaving the seat warmer on for long periods with the engine not running could cause the battery power to be depleted. • The temperature of the seat warmer cannot be adjusted beyond High, Mid and Low because the seat warmer is controlled by a thermostat.